Somewhere inside A Monster Calls lives one of the most complex stories of the year, a love letter to mothers and an embodied depiction of coping mechanisms. But rather than see these sides face to face, we’re left to watch a touching and a moving film playing hide and seek with our emotions. It’s a drag racer pushing its imagination pedal to the floor without remembering to release the parking brake. 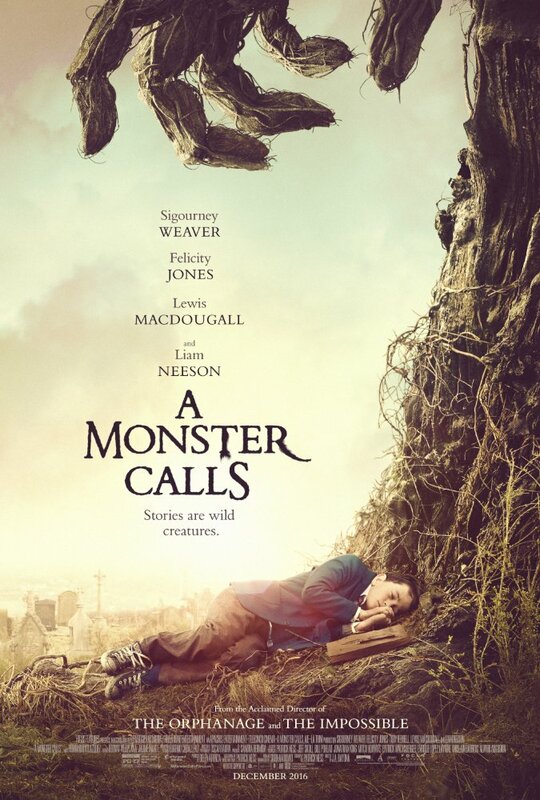 With more finesse, A Monster Calls could have gone from 0-60 while maintaining the control of its emotional core, and yet despite its best intentions, turns into a stop and go affair. This is a stunning film to look at, as well as a disengaging and largely boring one to interpret. We’re introduced to Felicity Jones as Mom. Her roughly chopped hair is an indicator of cancerous illness, as are the bottles of medicine scattered throughout the home. This worries her son Conor (Lewis MacDougall), a bullied and tortured young man afraid of losing the one he holds close and who holds him close in return. This relationship between a dying single mother and her outcast son is meant to be the impetus towards personal growth, but the spiritual connection just isn’t there. A Monster Calls certainly elicits an emotional response, because after all, it’s hard to not sympathize when you see living and breathing people feeling this much, although the drama comes across like a stock image in a Hallmark bargain bin picture frame. There’s too little life inside the lines. Then one evening at the stroke of 12:07, up too late on a school night, Conor calls forth the Monster (Liam Neeson). For how fearful he is in the schoolyard, the young boy does not cower or quiver at the feet of the towering humanoid tree. It looms large, eyes lit by fire, spiked and curled branches protruding each and every way. The Monster is there to tell him 3 stories, and the end of which Conor will be asked to tell a truth. Director J.A. Bayona successfully captures the expressiveness of the source material in these chapters, but the fables are flat pieces of paradox, lighting up the screen without adding flow or enough direct connectivity to the narrative. A Monster Calls has its fair share of delightful moments. These distractions aren’t a single one of them. Surprisingly, the ending of Bayona’s film finally finds its footing, taking a daring leap of faith while shuffling along the outskirts and the edges, considering how the effect of death alters that which it affects. The loss of a loved one, especially in these trying circumstances, prove to be an unforgivably painful experience. Death is the causal consequence in this relationship, and in A Monster Calls, the emotional affectations are drawn from its reservoir of grief with immense power. Rarely have I ever seen the process of letting go so imaginatively expressed in a film. I’m just disappointed such rich material doesn’t bleed through the rest of this ruled paper world.